My poor boy. The Vet warned me that it could get even worse before it gets better. It is quite common in the summer but he rarely sees it in the winter. It is often caused by bug bites….especially from spiders. 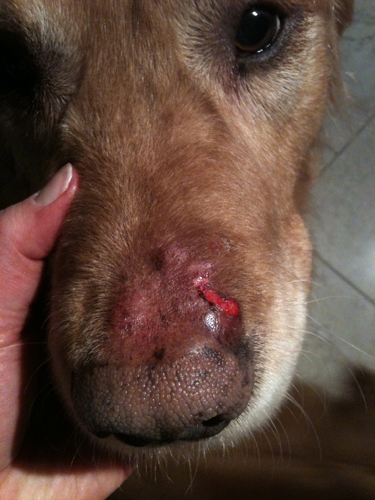 The dog develops a severe reaction and they get swelling and ugly blister like things that weep and burst. Wally is on some steroid medication. I feel so bad for him. The drugs are supposed to make him drink and urinate more and possibly be more hungry than normal. I just want to hug him and make it all go away. He got some Timmy bits to help make him feel better. Poor Wally, Give him a hug from me. Will do. He needs lots of loving now!